It would come as no surprise that I love hearing birthday stories. Last summer at the Mazza Museum Summer Conference, I heard James Warhola tell the story of the birthday card he gave his Uncle Andy Warhol, a famous artist, at the age of 7. On the birthday card was a hand-drawn Campbell's Soup can (click here to see the postcard, near the bottom of the webpage) and it said Happy Birthday Uncle Andy, August 6, 1962 from James. The intriguing thing about this card was that it was made before the Campbell's Soup art became popular. However, James knew from visiting his Uncle Andy's house that it would make the perfect birthday card. James Warhola has published over 30 books for children including If You Are Happy and You Know It: Jungle Edition, Bigfoot Cinderrrrrella by Tony Johnston, and The Wheels on the Race Car by Alex Zane. He began his career illustrating over 300 science fiction book covers -- a few I actually remembered from when I was younger! His reputation for excellent book covers caught the eye of Mad Magazine where he later became a frequent contributor. Additionally, he also was one of the artists behind the popular Garbage Pail Kids trading card series (my mom never let me buy these cards!) 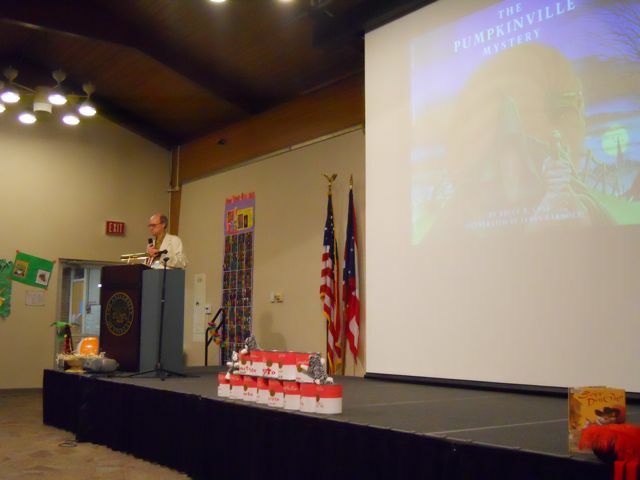 In 1987, he illustrated his first children's book, The Pumpkinville Mystery by Bruce Cole after he was "handed a kid's book manuscript by an art director and was instructed to do as he pleased." (jameswarhola.com). This week we enjoyed reading Uncle Andy's: A faabbbulous visit with Andy Warhol. James Warhola's father, Paul, was Andy Warhol's oldest brother. Andy dropped the A from his name simply because he thought it was easier to say. Uncle Andy's is about one of James' family trips to visit his Grandmother and Uncle Andy in New York City around the year 1962. My favorite illustration in the book is one where James is sleeping in a room of Campbell's Soup boxes from floor to ceiling! The text on the page says, "Uncle Andy didn't buy those soup boxes, he built them out of wood and painted each one. They were art and really important too, because Uncle Andy told us not to touch any of it." 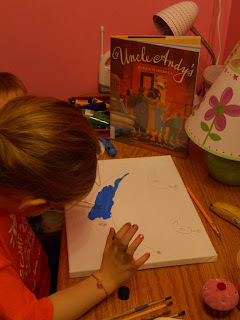 When we finishing reading Uncle Andy's, my daughter said, "I know what we can do! We can paint!" She went to the kitchen to find a common item to paint in the style of Andy Warhol. I assumed she would come back with a Campbell's Soup can, but instead she came back with a -- BANANA! In the meantime, I had found a YouTube video on Andy Warhol. We watched it before heading downstairs to paint. Before she started sketching, I tried to talk to her about the paintings that she had just seen by Andy Warhol in the video to help her with her painting. However, she explained she had a clear understanding of Pop Art. Her mind was set on what she was going to do and I wasn't going to get in her way! 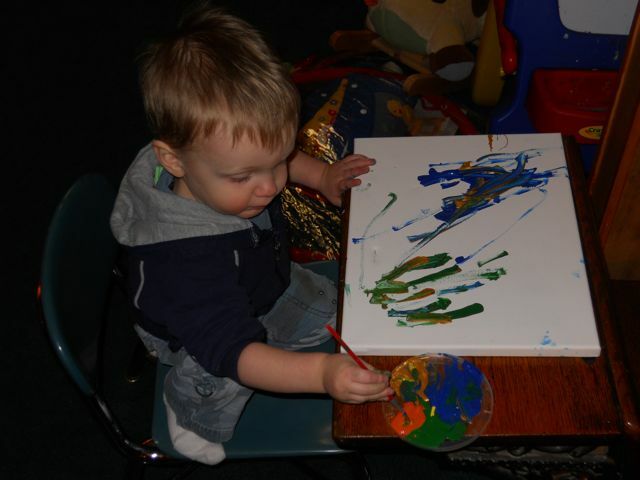 This gave me the opportunity to set up the little man with a canvas of his own. 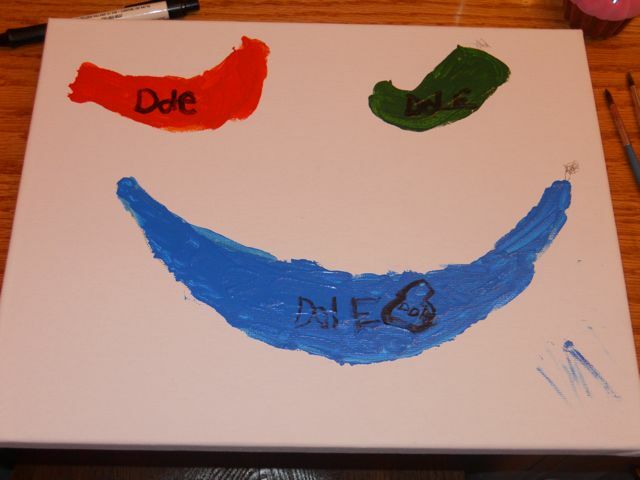 While her Banana-Pop-Art painting was drying my daughter asked for another canvas. She must have been inspired by Andy Warhol's 25 siamese cats that were all named Sam. You can read more about these cats by reading Uncle Andy's Cats by James Warhola. 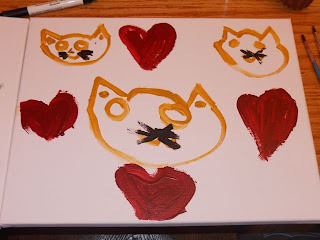 This painting my daughter called Love Cats. This one she called Banana Smile. Maybe someday these paintings will bring over a million dollars at auction like many of Andy Warhol's paintings! I was intrigued by James Warhola's stories about his family's junk business in Uncle Andy's. It is obvious that there was stark contrast within the Warhola family -- Jame's dad was a junk dealer from Pennsylvania and his uncle was famous artist from New York. However, from reading the book and doing a little research, James Warhola explains that his junk-dealing father was somewhat of an artist too. "My dad was almost a frustrated artist in his own right. He had a good eye for things. In fact, early on he was always bringing home things for me to make art out of. I was more of a traditionalist in certain ways and I couldn't see it the same way as my father." (NPR). 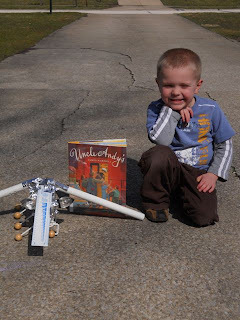 The experience reading Uncle Andy's helped inspire my son to build a bug out of junk. This week is Right to Read Week at his preschool with the theme "Camp Read A Lot". 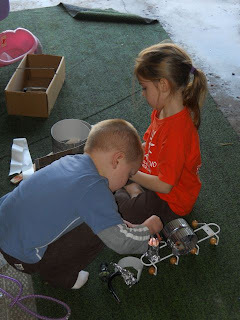 Every child was asked to make a bug to display at school. 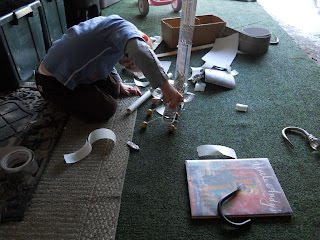 I thought of James Warhola's father as I was gathering up a bunch of odds and ends from the garage for him to make his art project. I told my son that he could use anything in the box to make his bug. Then by coincidence, I was pulled away by my youngest son (probably to change a diaper!) and I left my other two kiddos alone in the garage. I came back to a bug that already had legs, a body and a head! I shooed away his sister after creative differences started to surface. He added a few final touches like eyes, a nose, and wings. Here is my son with his Ship Bug 2000. He thought the wings made his bug look like a ship from Star Wars. I think he learned what James Warhola learned early on from his father and Uncle Andy "that art can be anything and is all around us all of the time." (Warhola.com). Just like last week with Harry Bliss, I have to share a photo from last summer 2011, at the Mazza Museum in Findlay, Ohio. In this photo James Warhola is talking about the first children's book that he illustrated in 1987, The Pumpkinville Mystery by Bruce Cole. Really cool ideas, Eric. I was not familiar with James Warhola (those I have read a few of his books without realizing it, and collected Garbage Pail Kids cards when I was a kid), and can't wait to check some of his books out! 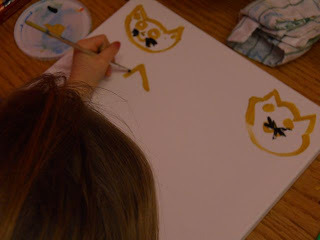 My kids love working on canvas, too. Makes them feel like real artists, I guess. Colleen - I think working on a canvas does allow kids to feel like an artist. I think we need to get a cool easel to make it even more exciting! Love the bug he made and my son would too (especially with the reference to Star Wars!) This is such an awesome blog and I LOVE the concept!!! I'm a new subscriber - thanks so much for linking up to Kid's Co-op! Thanks Lorie! I am so glad I found your blog too! I am following on Facebook! Honestly, I had no idea Andy Warhol's nephew is a children's book author. I'm eager to check out "Uncle Andy." Thanks Eric! Kirsten, I had no idea either until I saw him speak last summer. I think you will really like Uncle Andy's! Thank you so much for an intro to a grand new author (for me). These are some books I definitely want to lay my hands on! Thanks for stopping by Joanna! Last night we read Aunt Hilarity's Bustle by Helen Ketteman, Illustrated by James Warhola. I really liked it too. The illustrations add quite a bit of humor to the already silly story. I had no idea these books about Andy Warhol existed and I must get to the library! Thank you for linking to the NPR interview. Your daughter's paintings are lovely and your son's bug completely rocks. It looks like something out of Naussicca of the Valley of the Wind. I liked the NPR interview too. I was so glad I found it. You got me on Naussicca of the Valley of the Wind. I had to Google that one! It's a great Studio Ghibli anime, one of my favorites! It's not for younger kiddos, tho. My Neighbor Totoro is a sweet story that's wee one friendly. We are big manga and anime fans here. Very cool! I am going to see if it is available on Netflix.